BREAKING IN is a confidently executed action thriller written by Ryan Engle and directed by Australian James McTeague, best remembered for his action flick V FOR VENDETTA. 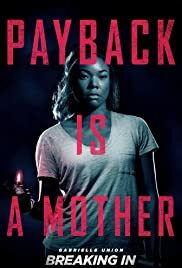 The film centres on a mother who uses her wits to outsmart the home invaders and save her kids, the film arriving appropriately timed for Mother’s Day. The film opens with an older black jogger taking to the streets for his local exercise. It is quite clear from the way the camera works that something nasty is going to happen, which predictably would be him being hit by a car. When this occurs, the shock and rise in volume of the soundtrack is enough to jolt even the least suspecting from their seats, this followed by a gruesome crunch by a foot of the man’s face lying on the road. The first thing that comes to mind is whether all this violence is necessary. 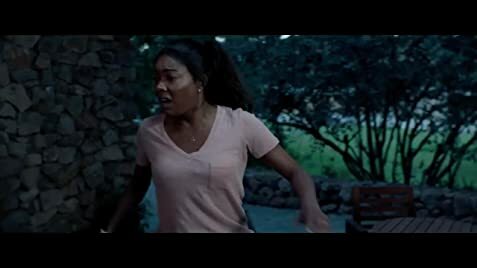 Necessary or not, the next scene shows the jogger’s daughter, Shaun (Gabrielle Union) taking her two children to the dad’s mansion out in the country in preparation for the house’s sale. But burglars creep in, looking to robe the safe for a ton load of cash (the American dream, in the words of one of the burglars). They have no qualms of murdering the children and the mother who must protect them, which makes good thriller fodder of fans of this genre. Despite the simple story, the film turns out pretty well with nail biting suspense from start to finish with hardly a dull moment. The script which contains minimal dialogue is smart enough when it wants to. The mother who does not know how large an acre is (when questioned by her son) turns out pretty smart when she has to protect her kids. “I am your mother, it is my job to worry about you!”, “You broke into the wrong house!” are examples of simple yet effective no-nonsense dialogue. The only thing unexplained in the film is how mommy knows all those martial-arts moves. (The promo screening was preceded by a martial-arts demonstration by a local martial-arts club.) The script also capitalizes on the current female/male issue of equality rights and harassment. “There is nothing you can do, you are a woman,” yells one of the burglars, Eddie (Billy Burke) to Shaun. Shaun later demonstrates that he is as then a man at the mercy to a woman, to the cheers, even by the men in the promo screening. It is also good to see coloured good guys and the whites as the villains. The cinematography by Toby Oliver is impressive especially the exterior shots in the night when Shaun is outside the mansion. Lighting is often just sufficient to see the figures moving about, The mansion interiors are also well-shot revealing the vastness of the modern design. The soundtrack contains a neat, pulsing beat to the action and includes a catchy tune when the drones are activated by the son, Glover. The choice of having the hispanic looking psycho as the last surviving killer is a good one. Richard Cabral (playing Duncan) is perfect as the psycho villain with his huge eyes. lean totally tattooed body and weird accent. Duncan clearly derives more pleasure in slaughtering the children then getting the cash. 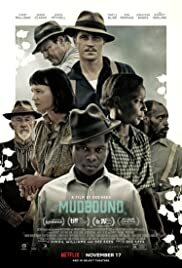 MUDBOUND, a Netflix original movie, is understandably a difficult film to be made for general audiences dealing with racial tensions, mixed relationships and the Ku Klax Klan. Despite complaints about Netflix movies not being ‘real’ movies distributed in theatres, in Netflix defence – it is thanks to them that difficult films like these, worthy and gut wrenching get made. MUDBOUND is a film about class, friendship and the fight against ‘the land’. The characters are pitted against a landscape of mud, with the elements of nature working against them. Just as they are about to succeed, the characters are pulled back into the mire. Hence the film is entitled MUDBOUND, and also perhaps it is a metaphor used too often in the story. The film is narrated by a few of the story’s characters but mostly by Laura McAllan (Carey Mulligan). The story follows two families, one white, the McAllans, newly arrived from Memphis to his new farm in the Mississippi Delta. The other, the Jacksons are coloured folk, sharecroppers who have worked the land for generations, but struggling to make a living. Laura’s husband is Henry (Jason Clarke), a decent man, though stuck in his racist ways and they have two daughters. The father-in-law is a racist pig. The Jacksons are Hap (Rob Morgan), Florence (singer Mary J. Blige) and children. The film setting is just after World War II. The end of the war sees the return of Jamie McAllan (Garrett Hedlund) and Ronsel Jackson (Jason Mitchell). The war allows the race barrier to be broken between the two war heroes but their friendship is not tolerated by the town, especially the father-in-law. When it is discovered that Ronsel bears a son with a white woman (a German during the war), he is brutalized by the Ku Klax Klan. Based on the novel by Hillary Jordan, and written for the screen by director Rees and Virgil Williams, the plot follow multiple stories divided between the two families. Rees’ film flows smoothly with each story transitioning into another without the feeling of Rees acting like a cop directing traffic. The film’s most unsettling scenes involve Hap Jackson’s infected leg, shown with all the pus and sores and the other the sudden appearance of the Ku Klax Klan. Ronsel’s beating is also not easy to watch. Rees gets her point across. For a film about families working the land, Rees should have included more scenes depicting the hardship of toiling – though a few token ones are included. The same goes for the war segments with one or two scenes in the tank and in the fighter jets. The only trouble with MUDBOUND is the lack of one central character. As the story divides between Laura, her husband, Ronsel, Florence Jackson and Jamie, the film loses its impact. 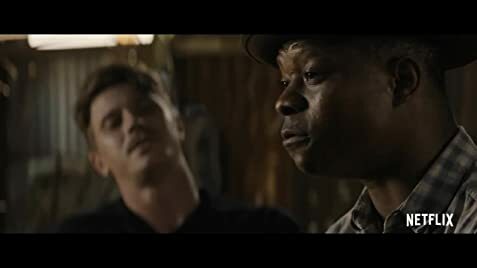 Still, MUDBOUND has nary a dull moment and gets its message that friendship and tolerance will save the day. Doctor Strange: About Ten Hits seems like it could be a lot of fun! And they seems to have gotten the belts right, too.